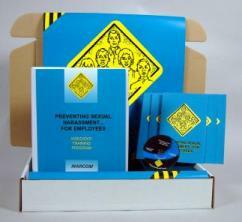 MARCOM's "Sexual Harassment... for Employees" Safety Meeting Kit discusses various forms of sexual harassment, explains how to avoid inadvertently sexually harassing someone and reviews the procedures employees should follow if they feel that they or a coworker are being sexually harassed. Most employees have heard the term "sexual harassment", but many of them do not know exactly what it means. Materials in the kit include a video program, five motivational posters, and 30 employee booklets. The posters in the kit remind employees to be sensitive to actions that might be interpreted as sexual harassment. The video program and employee booklets include information on what constitutes sexual harassment, behaviors to avoid, recognizing victims and harassers, avoiding "accidental harassment, and more. The video program in the kit comes with a comprehensive leader's guide, reproducible scheduling & attendance form, employee quiz, training certificate and training log.